Angiography is a lumen-based imaging technique. Being able to visualise the "pipes" can help us to manage stroke patients. Blood vessels may be narrowed or occluded or show focal strictures and dilation (beading - like beads on a string) or contain thrombus or show signs of dissection or even vessel spasm. 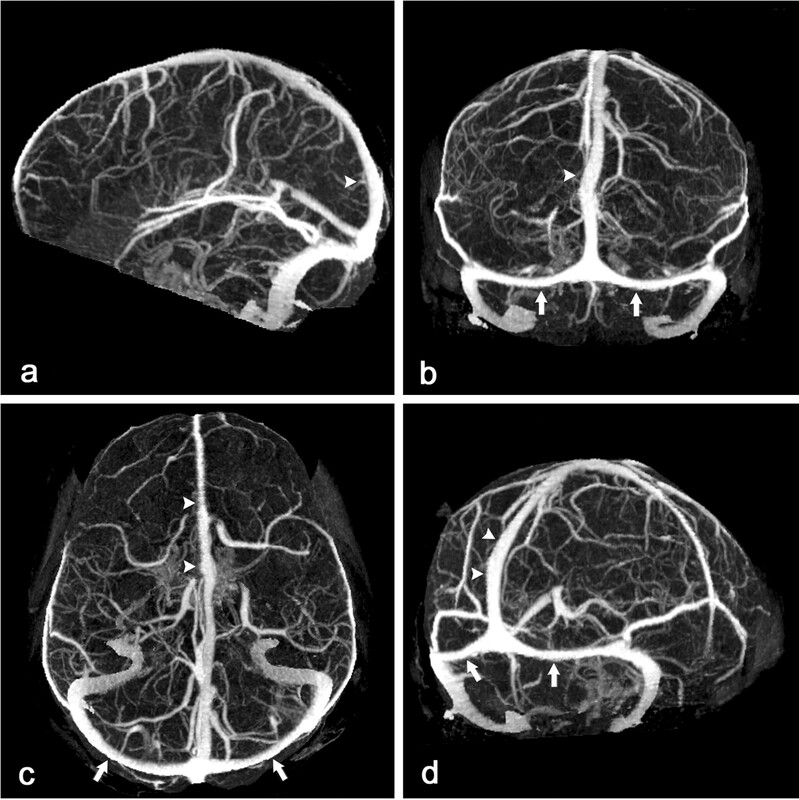 Vessels may be aneurysmal or show vascular malformations. All of these findings can help us to optimise patient care in terms of establishing the correct diagnosis and management. 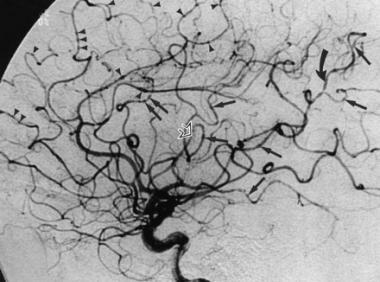 Angiography can show changes with time (temporally) as contrast proceeds through the arteries, capillaries, and veins of the brain. Data is acquired at different points (spatially) and so a 3D picture can be built up using computerised image processing. There are several different types using either X-rays (DSA/CTA) or MRI. The gold standard is DSA but MRA and CTA have reduced the number of catheter based cerebral angiograms performed for purely diagnostic reasons. Cerebral DSA is now more often a second line test when anomalies have been found and intervention is needed. Cerebral DSA has long been regarded as the gold standard in terms of definition and accuracy but involves an invasive catheter based procedure with a small but real risk of vascular damage and usually quoted 1% risk of stroke. Death is seen in 1 in 1000. It is done in the cathlab and takes 20-30 minutes. Vascular access is gained via the femoral artery (radial artery is gaining more popularity nowadays) under local anaesthesia by an interventional neuroradiologist and the catheter is passed into the origins of the cerebral vessels (carotid and vertebral) and about 5 ml of contrast injected and a cine film is taken. Image manipulation can remove the bone and gives an excellent view of vessel anatomy and pathology. DSA is the imaging of choice when there is a likely treatment gain to be considered such as pre operational investigation of an AVM or Aneurysm or suspected Vasculitis where the benefits of accurate diagnosis outweigh the risks. 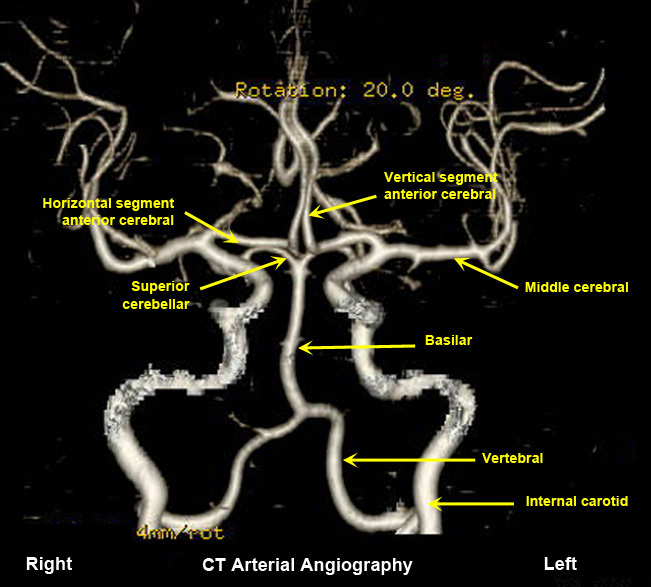 DSA isn't always needed as CTA can actually be better than DSA for looking at aneurysms. Assessment of detected extracranial or intracranial atheromatous disease. 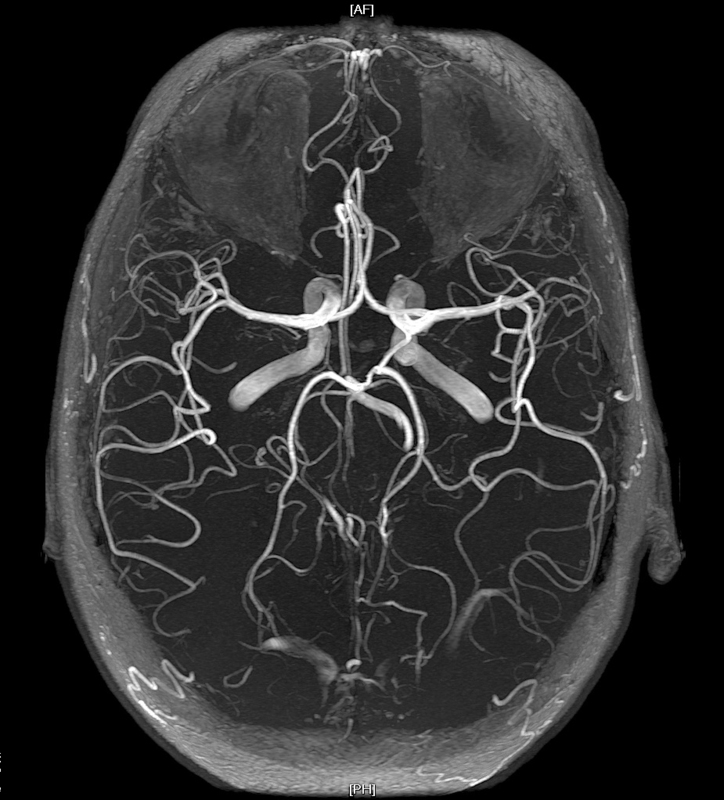 Suspected venous sinus thrombosis when MRI is inconclusive. Highly vascular CNS tumours when pre-op embolisation is required. CTA uses sophisticated computer analysis to provide detailed, 3D images of the blood vessels. It is a quick and useful test particularly for diagnosis large vessel occlusion and selecting patients for thrombectomy. 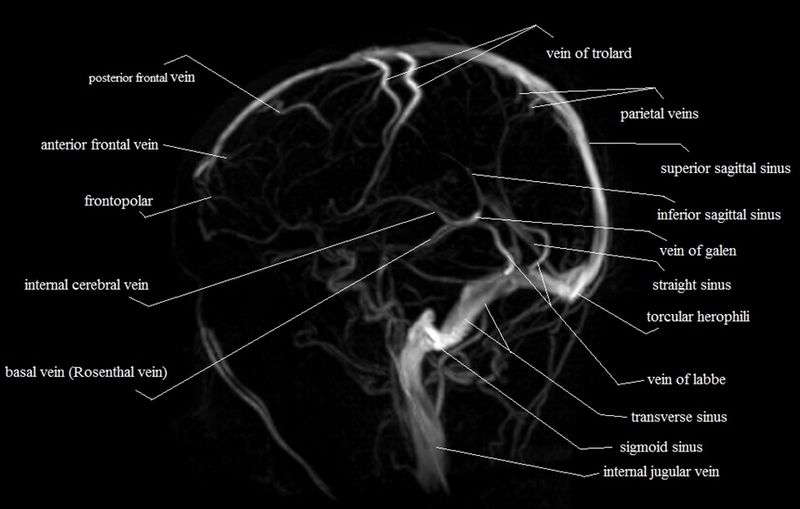 CTA can provide useful information on vascular anatomy. It has better spatial recognition than MRA but is not as good as DSA. It requires an injection of radiocontrast usually Iodine containing which can cause renal effects and allergies. CTA also requires a significant dose of radiation. CTA is almost as accurate as DSA at picking up extracranial stenosis and is more accurate the more severe the stenosis. CTA is useful for diagnosing dissection. CTA is very good at detecting intracranial stenosis. CTA is superior to MRA TOF and in most cases is superior to MRA. Often times however the choice of test also depends upon what is available and most convenient. It is avoided when there are issues with contrast allergies and renal disease and the eGFR must be known. 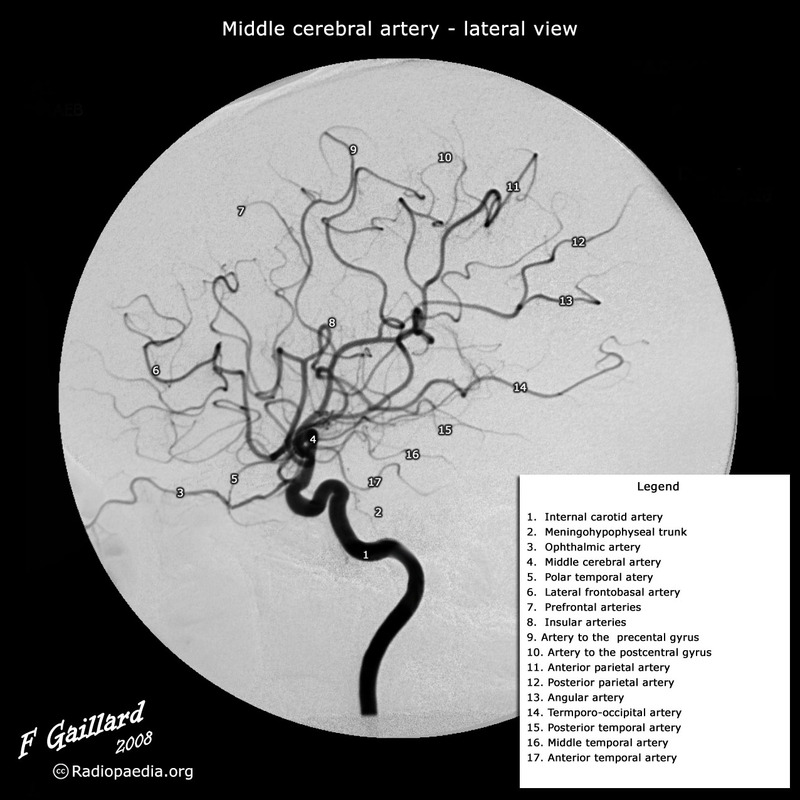 MRA is a useful non invasive method to study the cerebral vasculature. It works by enhancing the signal form moving blood and suppressing the signal from stationary tissue. There are two main types of process, Time of flight (TOF) and phase contrast (PC), neither of which require any contrast to be given. Lastly there is contrast enhanced MRA in which gadolinium is given. Time of Flight MRA is dependent on the flow and the movement of the protons in the blood through the imaging plane. The tissue is first bombarded with RF pulses and the fresh moving blood entering the slice retains its signal intensity and contrasts markedly with background tissue. There may be some overestimation of the length and severity of a stenotic lesion due to technical reasons.It can be used for both venous and arterial flow. Phase contrast MRA involves taking 2 images directly after each other using opposite gradients and then subtracting one from the other with the flowing blood being the difference. It tends to used more in cardiac and thoracic aorta imaging. Contrast enhanced MRA can be done by giving Gadolinium and this enhances the intravascular signal and scan acquisition is done such that arteries are imaged at the point of peak intravascular opacification. Gadolinium causes shortening of the T1 relaxation of blood compared with background tissue leading to the high signal intensity of blood on T1-weighted sequences. It is highly accurate and reproducible and can be done much quicker than the non invasive techniques. Flow related artefacts are few. The main issue is giving Gadolinium. Gadolinium chelate agents do have minor side effects. They can cause severe anaphylaxis and renal dysfunction. They are generally considered safe in patients even with abnormal renal function. There is a small risk of nephrogenic systemic fibrosis. In practice CE MRA has similar accuracy to Cerebral DSA. Again one of the major problems is an overestimation of stenosis which can be significant in selecting patient for potential surgery. 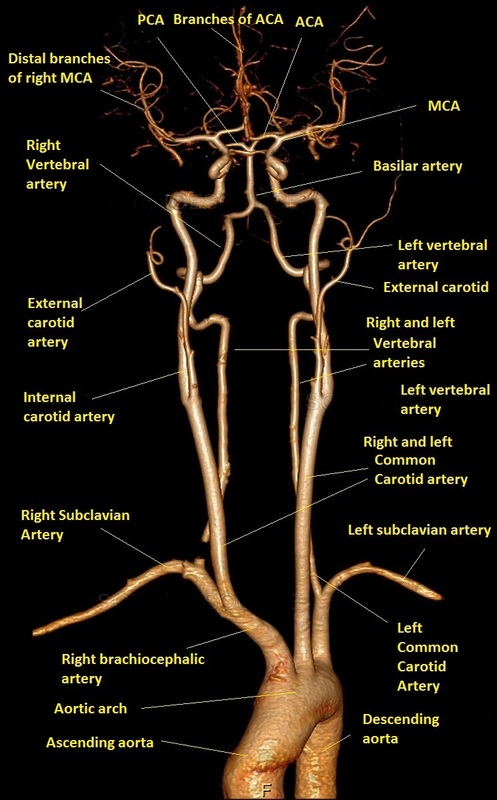 CT venography (CTV) is a technique targeted to assess venous anatomy, determine venous patency and delineate collateral circulation. It may often be combined with CTA. It is most useful in the diagnosis of Cerebral Venous Thrombosis.